* January 2015 - This blog post has been superseded by a new version, please click here to go to it. The Imperial War Museum (IWM) launched Lives of the First World War (LFWW) yesterday, Monday 12 May 2014. There were pieces on tv and radio and in many newspapers. I wonder how many people logged on yesterday and started to search for their solider ancestors? And how many managed to find Great-Grandad? I have been monitoring the user feedback since I started beta testing the new platform a couple of weeks ago (see my two previous posts here and here) and I have been a little bit worried that the IWM might have made a mistake in the way this potentially wonderful new method of saving our ancestors stories has been set up. Many of the people who accessed the feedback forums, even the beta testers who were drawn from experienced family historians and military historians, expressed concern that the method for finding an ancestor and adding a story was too complex. This post is an effort to support those people and the IWM - give it a chance! - the admin staff are promising ongoing improvements - we must continue to tell them how we find the system so they know what to change. This is how I found my husband's Great-Grandfather and how I added a story about him. It cost me nothing and was fairly easy to do with a few simple steps. The OH's (my other half!) great-grandfather was Joseph Croft, born 1892 in Barnsley, South Yorkshire. On the birth certificate of his eldest child Gladys he is noted as being a Private number 48081 in the 20th Labour Battalion Notts and Derby Regiment (and previously a Carter for Barnsley Corporation). This was a lucky find for me as Croft is a fairly common name in Lincolnshire and Yorkshire and finding the military details for a man who survived the First World War is much harder than finding them for a man who died. For an ancestor who was killed in the First World War I would have started at the Commonwealth War Graves Commission website - see my previous post about finding men from the Redfearn Brothers Glassworks War Memorial and adding them to LFWW. After opening LFWW (https://livesofthefirstworldwar.org/) and logging in (you do have to create an account to use the site, but you don't have to pay to do this, but I would suggest that if you don't want your real name on view online that you use an alias for First Name and Surname) you will see a search box at the top of the screen. Be prepared to try a few different ways of searching for Great-Grandad - if one thing brings back lots of results try another way. Entering Joseph Croft brings back 31 results - actually that's not bad - but to pick out the right man you would need to know either his regiment or service number. I was lucky and found this information on Gladys' birth certificate, as you have seen above, you might also find this information on the edge of his medals, on a paybook or other First World War documentation, or you might be an experienced family historian and have already found his Army Service or Pension records on Ancestry (which is free to use in many libraries around the country). Another way of searching is to put in your man's service number. Joseph's number was 48081. That brings back 23 results and using the filters on the left of the screen it is easy now to pick him out. I clicked View all under the First name heading, and clicked through the options until I saw Joseph - there was only one man called Joseph with the service number 48081 so I chose him. Sure enough he was in the Nottinghamshire and Derbyshire Regiment confirming that I had the right man. Click on his name to open up his very own page. Now I have Great-Grandfather the first thing to do is to Remember him. Now I'm at a bit of a disadvantage showing you this as I've already added some information to Joseph, so to compare I've shown you a man to whom I haven't added anything yet. Walter Armitage - he's my OH's 2x great aunt's husband's half brother, but you didn't need to know that! - Walter is showing a silhouette in the image box, whereas Joseph has an image of his cap badge from the Notts and Derby (I don't have a family photo of Joseph, but I wanted to put something in the box). Walter has Date of Birth: not yet known and similarly Date of Death: not yet known. Don't be disheartened by this - it is easy to add this information. But back to remembering your man ... just click the Remember button, the big light blue one under his name. The 0 will turn to a 1, if someone else is also remembering your relative it might already show a number, don't worry, more than one person can remember a soldier. Incidently I keep saying soldier - the LFWW people are promising sailors, airmen, nurses and even civilians as time goes on, but at the moment the men in the database are all soldiers who received at least the British War and British Victory medals as the seed data is taken from the Medal Cards (read about Medal Cards here). Right - now we are going to add a story to Joseph's page and a bit of information about him. I have Joseph's birth certificate, his marriage certificate and his Army Pension records. You can't get any of these things via LFWW (as yet) so the thing to do is to add them as an External Link and enter the information from them yourself. This won't cost anything. Searching Official Records, this will cost you money (mostly), the records appear to be the same ones available on Find My Past, but even having a subscription on that site doesn't save you on here - you'd have to pay again to add the links to Census returns and Army Service Records. You might already have this information at home, so read on to find out how to add it for free. Uploading an image, like the cap badge I have used for Joseph, but it could be a photo of your soldier, a scan of a letter or a piece of documentation you own such as a paybook, but NOT a scan of any official document you have had to pay for from Ancestry or Find My Past - that's breaking copyright. Use your Personal Knowledge, this can be almost anything and the process is similar to adding a story attached to a piece of evidence. Click on the Add an External Reference button. I have Joseph's marriage certificate - bought years ago when I first started doing the OH's family history. I can't upload a scan of it to LFWW, it is a copyright document, but I can add the information from it. If I was adding a piece of information from Ancestry or Find My Past I could add a Website External Reference ... if I'd found the information in a book or magazine or item from an Archive I'd choose the second ... but we are adding a marriage certificate, so I chose the third option. The boxes underneath change for each option that you pick and helpfully they are populated with suggested text so you get an idea of what to put in. I put in "Copy of a Marriage Certificate" and the reference number I had used to order it, "Q2 1914 Barnsley 9c 549", for the source I just used the suggested "Copy from the General Register Office" and for description I put "This is a copy of Joseph and Alice's marriage certificate". You also have to justify why you are adding the information lower down this screen. So for Joseph's marriage certificate I put that it matched his surname and other names (from the Medal Card info already online) and in explain your reasons I added "These are my husband's great-grandparents". I thought that was enough, I suppose I could have said, "I bought this marriage certificate after searching the FreeBMD website for a Joseph Croft marrying a lady called Alice as I knew that those were the names of my husband's great-grandparents and I used the reference I got from there to order the certificate online from the GRO" - but that was just unecessary if absolutely true! Now click "Connect to *Joseph Croft*" and the system will think about it for a little while and then thank you for adding this evidence to Private *Joseph Croft* (your man's name *here* of course!). A new entry then appears under Medal Card - "Copy of Marriage Certificate" and it also notes that it is an external official document and was added by me (my real name that I used when I created my account, this is why I suggested using an alias when you create your sign up). The next thing to do is to pick out facts from the "Evidence". Click on the blue words indicating your evidence and a new screen opens. This screen summarises the information already known about the evidence - you can see all the data I entered in the screen above when I was connecting the evidence. Including my name! It does say on my screen snip that "2 Facts were added in this source of evidence" - that's because I've already been through and added Alice's name and the date of their marriage - but I'll tell you how to do it ... theoretically. Be careful if you look at evidence added by other people, be wary of adding the same information in duplicate - last night I managed to add Alice, Joseph's wife, twice and I've had to log a help request to ask how to sort it out, silly me! If you need help or do something wrong look for the blue question mark in the bottom right of the screen, click on that an a box will pop up for you to log your question or help request. Answers take a couple of days at the moment though. You should only add facts that you can see in the evidence you have added. So for this marriage certificate I have already added the date of the marriage and the name of Joseph's wife. I can also add his address on the date he married, his age and his occupation too. It is also possible to add a "story", which is free text and this could be a family story about the marriage or a memory about Joseph and Alice as a married couple. You can't add the names of the bride and groom's parents as a fact, but you could enter them as a "story". To add the address from which Joseph married I would scroll down where it says "Family and Civilian Life" until I see the heading "Addresses". On the way past you will see headings for Spouses - this heading includes the fields for adding the date of a marriage. In "Home Type" I am going to choose "Parents" from the dropdown list that opens when you click the little arrow (little arrows mean 'more options' as my friend Lesley B used to say at IT class!) I am fairly sure that 55 Tower Street, the address on the marriage certificate is Joseph's parents' home address as that is where they were living in the 1911 census. In "Address/Location" I can type 55 Tower Street, Barnsley - it's odd that they haven't made town a separate field, so be sure to add it to the address or no-one will know where you are referring to. Country is just United Kingdom. And for the date options ... I used "Known at" in this case as I know he was at 55 Tower Street on the date of his wedding, 16 May 1914, because he states it on the certificate, but that doesn't prove he was there before or afterwards or for how long so I can't use "From" and "To". Click continue to carry on ... ignore "Add another Address", you can't add Alice's address here, you should only add facts to your soldier. The only way to record Alice's address is in a "story". Let's just click "Save these Facts" at this point. As with all computer systems LFWW can fall over at any time. Always SAVE your work. It's much easier to add things in little chunks than enter a whole load of information and then lose it all because something goes wrong. So keep SAVING! I returned to the Adding the Facts screen by clicking on the title for the "evidence" to add Joseph's age and occupation as stated on his marriage certificate. Remember to SAVE after each fact or after no more than a couple of facts at the very least. To add that "story" about Joseph and Alice, containing all the rest of the facts about their wedding that can't be added directly to Joseph's personal "Life Story" just click on the blue title for the piece of evidence again and this time choose "Share a Story" at the bottom of the Adding Facts from Evidence screen. Joseph Croft, a bachelor aged 22, working as a Boilersmith's Labourer and living at 55 Tower Street, Barnsley married Alice Ann Duncan, a spinster aged 19 living at 44 Castle Street, Barnsley on 16th May 1914 at Lodge's Memorial Primitive Methodist Chapel on Buckley Street, Barnsley. His father was Joseph Croft, a Gardener, her father was Thomas Duncan, a Joiner. I added Barnsley for place and the date of the marriage at the bottom. Note that at the top of the screen in my snip it shows my added story "The Marriage of Joseph and Alice", so it looks as if I can go back in and correct my stories and add information to if if I want. Other users will be able to see your stories but not change them (as far as I can see). Remember to click Continue and SAVE! The "story" about Joseph and Alice's Marriage. Back on Joseph's screen, the story shows at the bottom of the page. I don't like the way it splits the words up, but I suppose that's a minor grumble. Note how the caption states that this was added by me and is attached to the "evidence" Copy of Marriage Certificate. The facts are displayed on a grid with multiple tabs in the middle of the screen - we have been working on the tab "Family & Civilian Life" so clicking on that opens it up and you can see Alice's name, the date of their marriage and Joseph's home address on the day he married. If this grid is too large for you try changing the magnification at which you are viewing your browser (in Internet Explorer this option is at the bottom right of your screen, in Firefox it is in on the toolbar in the menu indicated by the three lines) I prefer viewing these pages at 75%, you can see more at one go. Adding this information has been completely free and although it has been a bit laborious I have been able to add all the information from Joseph's marriage certificate. I could move on to his birth certificate next or his Army Pension Records, but I think that's enough for today. Please feel free to visit Joseph Croft next time you are logged into LFWW - I might have added that extra information by the time you call in! 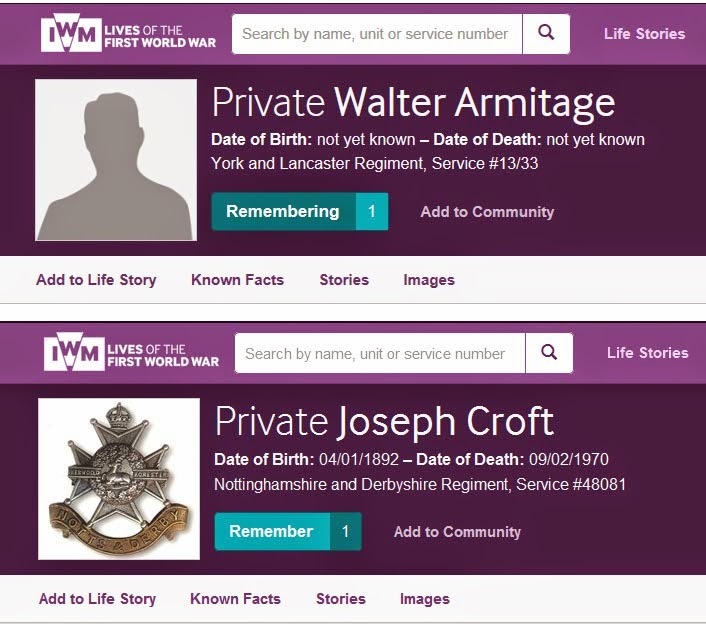 I hope this has helped you to see how information can be added to LFWW easily and at no cost to you, so please go and remember your First World War soldiers (and others as the project progresses) now. Excellent work Linda. Most helpful - thanks! Thank you Robin. I have my worries about this project, but I think it is very worthwhile so I'm going to support them as much as I can. Really helpful, thank you very much. I have now managed to add everything I wanted to except inserting a photograph at the top of the page, in place of the silhouette. Please do you have any tips? First you need to add an image. Where I haven't got a photo of a man I've used his regimental cap badge or a newspaper snip from the deaths column in the local paper (mention where you got it from in the description). Once the image is uploaded revisit it - it will be at the bottom of the page - click on it and you should see an option to set it as the profile picture. Thanks for the query, I hope you find my response useful. Thank you, will try this. Thank you for all your work on this, we would not have got anywhere without it. Great blog, nice to see even the Lives team are now referring people to it from a link on their FB page. Please keep adding your useful hints - they are most helpful.